Following an accident that almost cost him his life, Howard Falcon was not so much saved as he was converted, through the use of prosthetics, into something faster, stronger and smarter...but also slightly less human and more machine than he was. And with this change came an opportunity - that of piloting a mission into Jupiter's atmosphere and ultimately of making first contact with the life forms he discovers there. Captain Rackamore and his crew do. 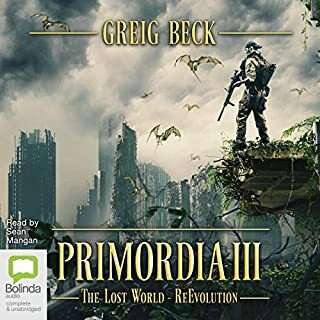 It's their business to find the tiny, enigmatic worlds which have been hidden away, booby-trapped, surrounded with layers of protection - and to crack them open for the ancient relics and barely remembered technologies inside. But while they ply their risky trade with integrity, not everyone is so scrupulous. Adrana and Fura Ness are the newest members of Rackamore's crew, signed on to save their family from bankruptcy. Only Rackamore has enemies, and there might be more waiting for them in space than adventure and fortune - the fabled and feared Bosa Sennen in particular. 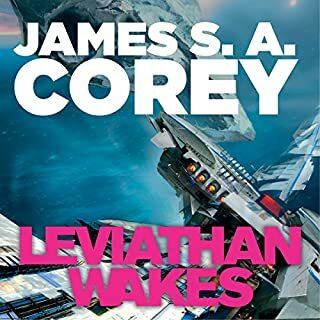 I usually listen to audiobooks as I doze off to sleep at night, but this one was such a great adventure it kept me up all night wanting to hear more and more. It had great storyline, characters, action and suspense. 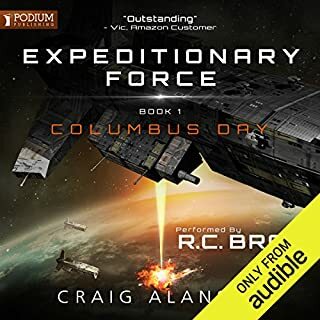 While it is a space adventure, I kept getting vibes that it could've just as easily been set on a 16th century pirate ship, with a lot of detail spent on crew interactions and antagonisms and the less-than-spectacular living arrangements while on the ships. Also it reminds me a bit of Firefly, which I also loved. Great story. I enjoyed the tale in the first person, with an interesting young female character. Antiquated English nautical terms leant a cyber punk feel. Not sure if there is going to be another novel following, but it seems like it is set up to continie. I hope it does. I found the audio levels off, constantly had to adjust volume. I would be happily listeneing, and then for certain characters, the narrators voice was too loud. the story was good. but it could have done without certain parts that were boring and drawn out. 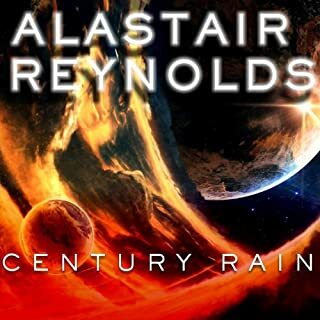 Love Alastair Reynolds and this book doesnt disappoint. Couldnt finish Blue Remember Earth, really didnt like it but Revenger is an easy and interesting read. Not a huge fan of female narraters, but Clare Corbett really suits the character and makes this story pop.....like the baubles really! Really enjoyable story and performance. the only problem I had was the voice volume was way too low, even with it turned up. 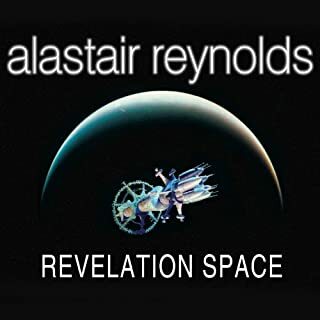 I came to this with some trepidation, as a Reynolds fan but not one for YA novels (as this has been referred). very pleasantly surprised though. A typical space romp, with the fun of treasure hunting and piracy, but with enough darkness to avoid it being Harry Potter in Space. Well written and read. the narrator masterfully portrayed the characters. The story was at Reynolds standard of execlence, if not raising the bar further. I'm not sure if it was the audio or the code used but some of the sentences seemed to lose volume right at the last syllable. however, this did not distract from the story. Great plot, Alastair never disappoints. Great narrator, thank you Clare for bringing the story to life. I found it a bit too Hollywoody. Audio is poor, levels all over the place. 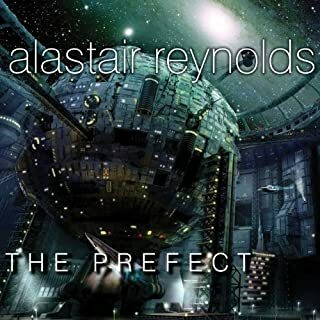 The first Reynolds book I haven't enjoyed at all. The plot is utterly lacking in credibility and cohesion. Awful characters. Terrible dialogue. 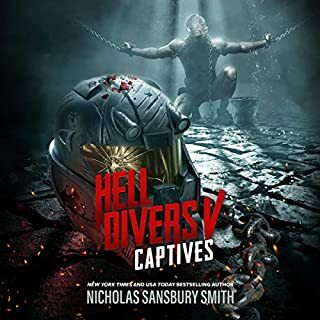 For me, the narration compounded the poor writing and the two combined created a naff cod-piratical world, full of idiotic country bumpkins and mockneys who I didn't care about, doing not a great deal for reasons I couldn't understand or believe. It gives me no pleasure to say it, but this is not a good book. Disappointing. 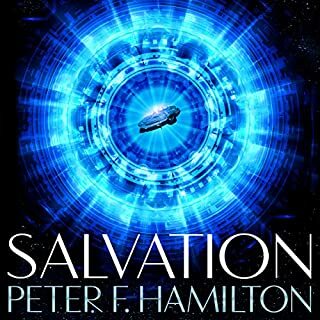 story was OK. it's based in a world with ancient techhnology where none of the inhabitants really understand what's going on. there no innovative scifi ideas if that's what you like. 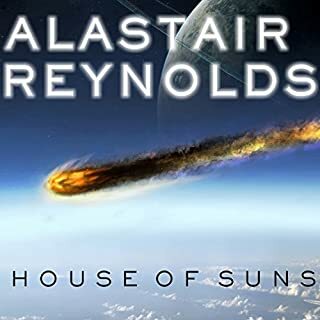 I've long been a fan of Alastair Reynolds and am always looking forward to his new books. Happily, Revenger is great. The story is fairly simple, the tale of two sisters - one who is captured by space pirates and the other who sets out to find her. It's a fun ride with well thought out characters and hints at a much bigger universe which I hope Reynolds will explore again in the future. 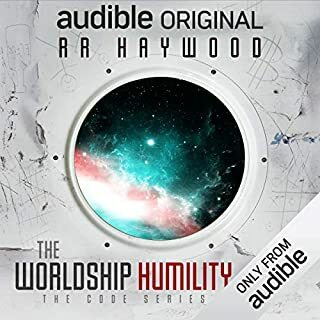 But failed to deliver I loved some of Reynolds books but this one pens out a vast history with untold words, alien's, planets, artifacts and mysteries only to focus on a few humans doing human stuff and a girl setting up a plan to kill another girl... What? I made it to the end so it's totally rubbish but it's 50/50 if I return this or not.. Another one of those sci fi books that's not really anything about sci fi the story could easily be altered to be pirates at sea or London gangs..
Shame really, I love Alastair Reynolds and this is good if you're a teenage girl (preferably), I'm an old bloke and it just misfires, I'm not the target audience; it would have been good to be warned. 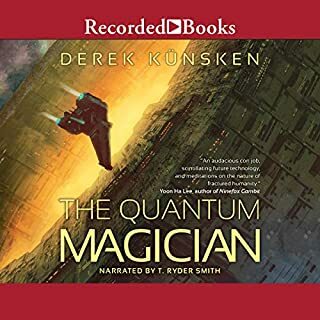 - as others have mentioned, the audio quality was very poor, but this could have been down to the narration. Quiet narrative interspersed with loud, often screechy, dialogue made it impossible to set the volume at a comfortable level. May be for someone, but certainly not for me. 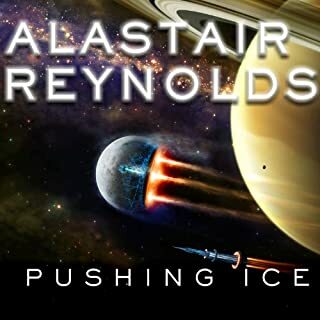 Would you try another book written by Alastair Reynolds or narrated by Clare Corbett? 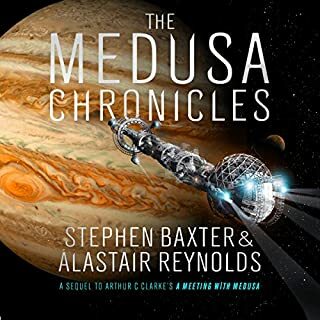 I thought Clare Corbett did a good job with the Narration, though I'm not sure about another Alastair Reynolds story - this was the first story of his I've read. Hopefully something with a story I find enjoyable? Which character – as performed by Clare Corbett – was your favourite? The narrators performance. There are a few exciting situations near the start of the book with some characters that are actually likeable. Reads more like a YA novel, which I wasn't expecting. YA needn't mean an inherently bad story if it's engaging, with interesting characters - I really enjoyed the Hunger Games series for instance. Unfortunately this wasn't the case with Revenger. I didn't really warm to the characters or follow their line of reasoning in a few cases, in fact I'm not even sure I like the main protagonist by the end of the story. I also felt it leaned way too hard into space as the high seas, with spaceships as sail boats, and 1800s English slang schtick. The metaphorical world where the story is set also really failed to grab my attention. There are also a few "it just so happens" moments which for me kill any suspension of disbelief. Sometimes I struggle with Alistair Reynolds. I have found some of his books absolutely captivating and others downright dull and memorable only because they were so outrageously dull. 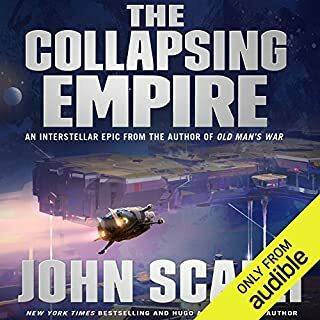 I loved the first two books of the Revelation Space trilogy, liked the third and really disliked The Prefect and Terminal World. 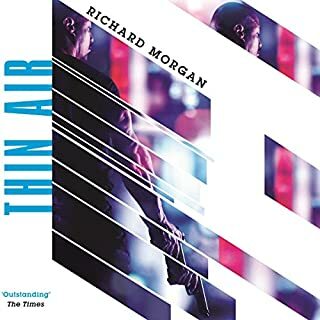 I'm glad to say that this is one of his better ones and the performance by Clare Corbett was excellent. A really good story with the potential for a cracking sequel in a very interesting universe. 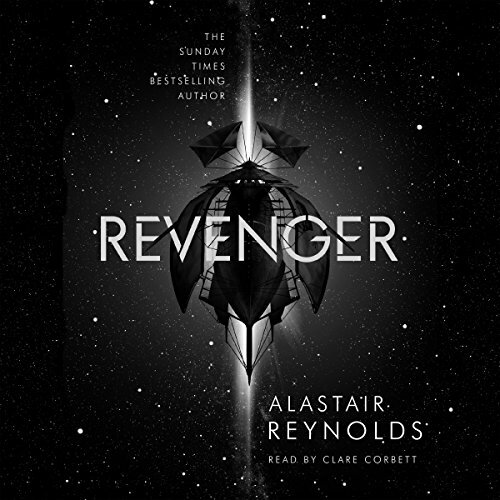 Revenger is a pretty straight forward pirate story in space. 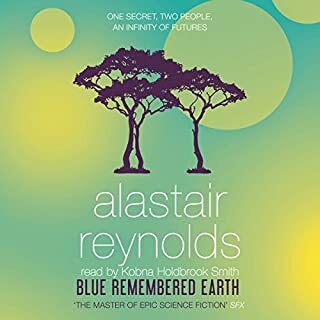 I enjoyed it, it was well paced and the characters were great although I felt a little under developed by Mr Reynolds normal work. But this story is not quite at the normal scale for Alistair Reynolds - unless this is of course just the beginning of a much bigger story. If this is the case I look forward to it. 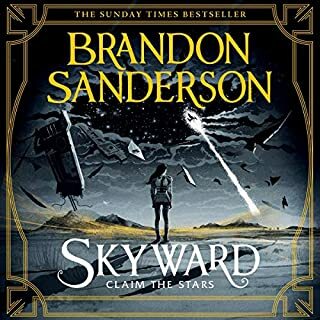 The story was still gripping and it made me look forward to listening to the next bit throughout the book which is always a good sign. What I really liked the most in the book is the universe that was explained fairly superficially but suggested so many mysteries about the occupations, the baubles, AIs, the civilisations and technology. I do hope there is more to come form this universe. I also liked the use of language to describe things, this was fun although if you are too analytical about it, it does seem weird to portray another universe entirely that speaks English but uses alternative, slang like English words. But I enjoyed this use of language by the characters. Maybe the universe is in fact our universe at another time and I have just missed the point until now LOL! 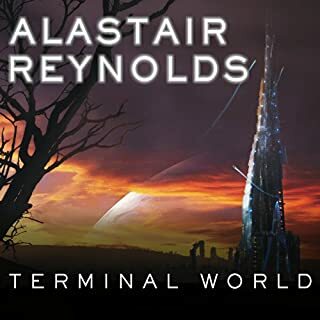 Always a big fan of Alistair Reynolds - one my favourite authors and I have enjoyed this book probably more so than his other recent work. Hope he continues the story in his next book - would like to see what happens next and what mysteries are to be revealed. Narration wise Clare Corbett was excellent with the voice acting. A few odd pauses (no big deal - probably a production issue) but as others have noted - if you are listening to this in the car there are a few sections that are very quiet (to be fair this is when it makes sense for the dialogue to be quiet in voice acting terms) but did make it very hard to hear at some points. I really liked this book - recommended. A bit borderline whether I finished it or not. Aimed at a younger audience than perhaps I expected from the description. Some interesting ideas, but very under-developed. More detail, more description, more back-story. Narration needs improving. Oddly stilted delivery at times - awkward gaps between sentences. Can't tell whether it is poor narration or poor editing. Also the volume is problematic. Quiet narrative interspaced between loud dialogue means that you are constantly fiddling with the volume control to try and keep it audible and comfortable. Generally could be much improved. Was Revenger worth the listening time?